Last month we posted quite a rant about every drink with tequila being called a Margarita. Most of the recipes sent to us called “Margarita” aren’t anything of the sort. 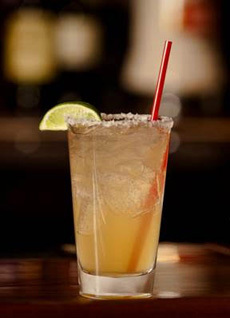 The establishments are taking advantage of the popularity of the Margarita (America’s #1 or #2 most popular cocktail, alternating with the Martini). But, as we explained, if you want to create a Margarita with a different spirit, or use a liqueur other than orange, call it something else. Otherwise, you muddy the waters for people who’d like to understand what a Margarita is. Use aged tequila instead of the blanco. Substitute blood orange liqueur or grapefruit liqueur (“grapefruit Margarita”) for the Cointreau. Use a different citrus juice, e.g. grapefruit juice in the grapefruit Margarita. Vary the rim, e.g. use chipotle salt. Tilted Kilt” target=”_blank”>The Tilted Kilt, a pub and eatery a chain, sent us a recipe for an “Irish Margarita” that substitutes Irish whiskey for Margarita’s tequila, they added the other must-haves: orange liqueur and lime juice. They even salted the rim. But they used less orange liqueur flavor, and made up the sweetness difference with agave syrup. We offer the recipe under its original name, though we think it should be called Margarita’s Irish Cousin. Margarita’s Irish Sister, made with Irish whiskey at The Tilted Kilt. An Irish Margarita from Restless Chipotle. 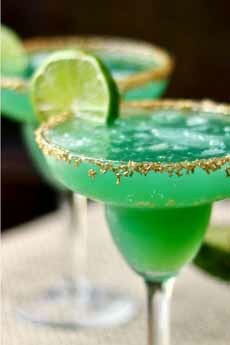 It uses blue Curaçao and pineapple juice, along with peach schnapps and aperol, to create the green color; plus a sugar rim instead of salt. Irish Margarita, anyone? 1. SALT the rim of the glass. 2. ADD the ingredients to a cocktail shaker filled with ice. Shake vigorously and strain into the glass. Serve to your favorite leprechauns.